We are pleased to inform you that Govt of Punjab education department has sent requisition of subject specialist required posts.In response of which the Finance department assured for positive feedback as well.Now such posts are in the pipeline of Punjab Public Service Commission.These posts are being announced in a very systematic way along with PPSC Headmaster and headmistress jobs.Aspirants must be prepare themselves for proposed PPSC Subject specialist exam.Such jobs containing grade 17 with handsome salary packages and perks.This recruitment shall be made only on Punjab level among most suitable eligible candidates as well. 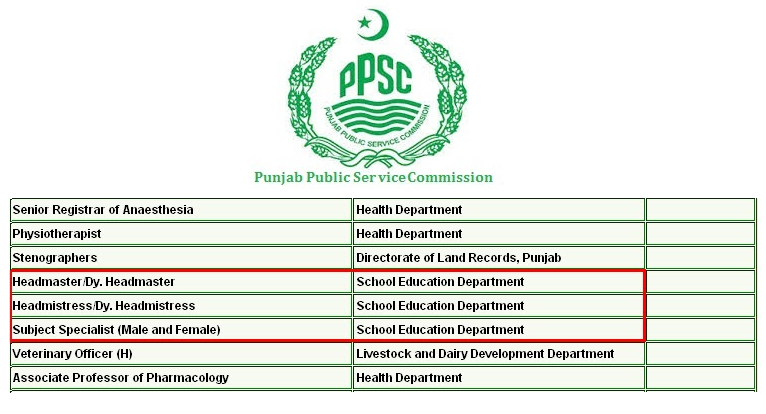 Punjab Govt currently focusing on major sectors as education and health.Education sector is being revamped through filling the vacant positions in this department.Subject specialists are required upon merit basis in order to fulfill the dire need as well.Every year education department send the proposal against the vacant positions. PPSC Select and recommend suitable candidates through a merit-based, transparent and expeditious process to promote excellence, professionalism and competence in the Punjab Public Service and render advice to Government.Right person for right job is ideal concept for each organization. Subject Specialist Qualification includes master degree in any subject along with B.ed or M.ed Compulsory. Age must not exceeding the 35 years and in case of female 38 years as well.Subjects includes English, Urdu, Islamiyat, Sociology, Computer, Mathematics, Chemistry, Physics, Social Work, Pak Study, Psychology, Philosophy, Social Sciences as well.Such Jobs have been designed to work for a particular activity or research area e.g to teach specific area of subject as well. Today we are living in the reign of cut-throat competition.Aspirants for getting such jobs must be prepare themselves in advance through such platform. Gotest is unique platform for online preparation against such positions. The candidates may get sample and past papers form here in order to secure remarkable score in the PPSC Subject specialist written examination.